The "problem" comes when people abdicate personal responsibility for their actions, and for their mental and physical well-being. Such an attitude is the antithesis of the Dhamma, yet, such adhamma is foundational to the "grievance mongering" which is embedded within what's being described in this topic as "liberalism". The problem comes because there are lots of people on both the liberal side AND on the conservative side of politics who abicate personal responsibility for their actions, and for their mental and physical well-being. THis thread, whether intentional or not, gives a strong impression that this problem is uniquely situated on the liberal side of politics and I think that this is wrong. Hmm, "grievance mongering" sounds to me like one of those labels that is used in some circles to dismiss genuine problems. Of course, there are a spectrum of problems (a.k.a. "grievances"). I presume that noone would would say that pointing out that people should not be killed or tortured is not "grievance mongering". And telling victims of those sorts of things that they should stop complaining and take responsibility for their own happiness would be laughable to anyone (I hope). Where is gets tricky is the range of discriminatory practices past and present. At one end (equal pay for the same work, for example) there is not much to argue about, since that sort of blatant descrimination has, thankfully, gone. Where many of the arguments occur is to do with how to make sure that everyone has reasonably equal opportunities. It's there that people can, and do, have quite divergent opinions. "I want it to feel like we are a government that's truly focused on everybody. Perhaps I'm more acutely aware of that sense having now led a set of negotiations in our government that brings together a range of parties. "I know I need to transcend politics in the way that I govern for this next term of Parliament but I also want this government to feel different, I want people to feel that it's open, that it's listening and that it's going to bring kindness back. "I know that will sound curious but to me if people see they have an empathetic government I think they'll truly understand that when we're making hard calls that we're doing it with the right focus in mind." “We keep imprisoning more people in response to dogma not data, responding to shifting policies and media panics, instead of evidence-based approaches to prevention, intervention, imprisonment and rehabilitation”. For one, some people who blame others don't necessarily mean it. Blaming others for one's own wellbeing is sometimes a form of manipulation, a way to get the upper hand, not a genuine belief that others really are responsible for one's wellbeing. You're going too far into individualism that way. 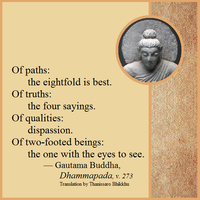 The Buddha did teach about admirable friendship being the whole of the holy life; and there are also teachings on the importance of social harmony (found, for example, in the principles of right speech). In an age and culture in which women and girls were in effect the property of the men in their lives, the Buddha not only accepted women as disciples capable of enlightenment, but even ordained them. If the masculine pronoun is mostly used in the Pali suttas, it's most probably for the sake of convenience, to keep the suttas more simple to chant. I would argue that, just as in the Satipatthana sutta 'a monk' can be taken to simply mean, 'a meditator', so too can 'he' simply be taken as, 'he or she' - ie, a practitioner. No sexism implied, it's just how people spoke in those days. Thus, I don't think we need to meddle with the Pali suttas, by changing them to make them more 'gender inclusive', since folks ought to already know that the Buddha was obviously referring to both men and women, when he (or the sutta compilers) used the pronoun, 'he'. A footnote at the end of a translation explaining this, ought to be enough, to calm any moral panic arising in a modern reader. I think that one cant take an "ism" out of an affected practitioner any more than cultural conditioning, but they are expected to grow out of it as they grow in the Dhamma assuming that they practise.